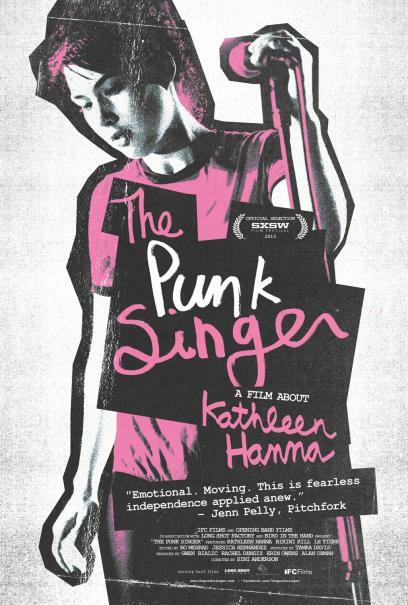 Confession: After hearing the names Kathleen Hanna, Bikini Kill and Riot Grrrl off and on for two decades, I really didn’t know anything about Hanna, her music or the highly influential feminist movement she co-founded until I watched Director Sini Anderson’s excellent documentary, The Punk Singer: A Film About Kathleen Hanna, on DVD last night. In fact, I admit that for many years I had confused Kathleen Hanna with Kristen Hersh of Throwing Muses, which is just embarrassing. So, I guess it’s extremely high praise for Kathleen Hanna, for being so doggedly determined and fiercely talented and also a thoroughly compelling human being – as well as Anderson, for coaxing her somewhat reluctant subject into revealing her life story with such profound intimacy – that I was completely engaged in The Punk Singer from the first few minutes. I mean, wow, this film is amazing! If you are already a fan of Kathleen Hanna then you don’t need me to tell you about how Hanna and her band mates in Bikini Kill championed woman in rock like nobody’s business, performing songs about subjects that made people uncomfortable but that stayed true to Hanna’s vision of inspiring positive change. Scenes of Hanna performing on stage in The Punk Singer reminded me of a cross between the late Poly Styrene and Henry Rollins. Punk Rock! There’s also an astounding amount of quality archival footage used in this film which will take you back in time to the beginnings of the Riot Grrrl movement as well as a time when Hanna was best friends with another rebel outsider, Kurt Cobain. I’m sure Kathleen Hanna could not have foreseen what would arrive in the wake if her casually scribbling the phrase “Kurt Smells Like Teen Spirit” on Cobain’s apartment wall. That is a story that takes too long to talk about. Former band mates and friends of Hanna including Corin Tucker and Carrie Brownstein of Sleater-Kinney, Joan Jett, Kim Gordon and Hanna’s husband Adam Horowitz of The Beastie Boys help to color the film’s rich narrative with their stories about what made Hanna a special, unstoppable force in music. But The Punk Singer isn’t just a music documentary; it is a true life story and a film that will draw you in as much as other personal musical journeys such as Jobriath AD, Nothing Can Hurt Me and Searching For Sugarman. I cannot recommend this film highly enough. The Punk Singer is available for purchase at Amazon.com and for rental and streaming through Netflix, where it has racked up a ton of well-deserved 5 Star Reviews. Though not my favorite, her new band The Julie Ruin has some pretty interesting tracks! I’d like to see ’em live. Glad you liked!